As teased a few days back, Samsung has officially announced its latest flagship Exynos processor today. If Samsung sticks to its trend (and it will) to using two different processors for its flagship smartphones, then many markets around the world will get their Galaxy S9 and Galaxy S9+ powered by this processor. 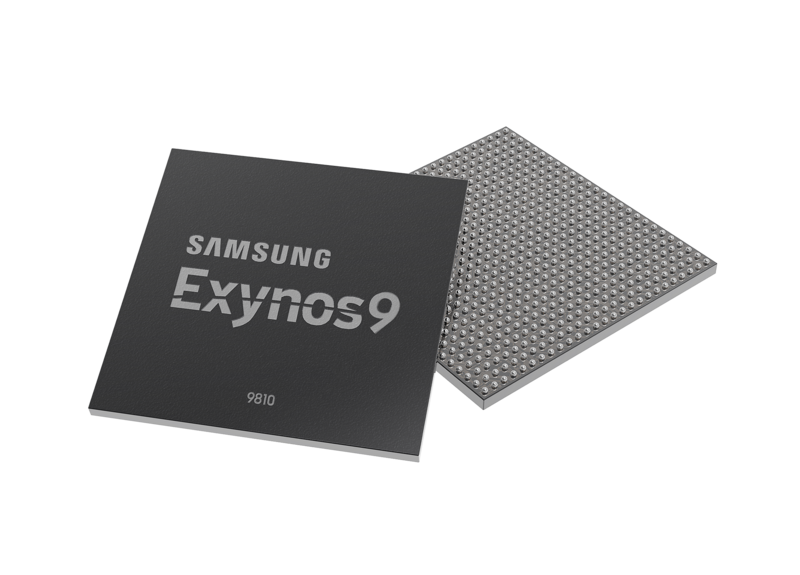 The Exynos 9810, part of Samsung’s Exynos 9 series processors, is built on Samsung’s second-generation 10-nm FinFET fabrication process. The Exynos 9810 comes with custom CPU cores, a faster gigabit LTE modem, and advanced image processing and machine learning capabilities. The Exynos 9810 is an octa-core processor with four high-performance cores and four energy efficient cores. The four high-performance cores are third generation custom cores that can be clocked up to 2.9 GHz. All of this offers a two-fold increase in single-core performance and 40 percent increase multi-core performance compared to the Exynos 8895. The new Exynos processor also comes with neural network-based deep learning for enhanced user experience and improved security. According to Samsung, the processor can accurately recognize people or items in photos for fast image searching or categorization. It can also scan a user’s face in 3D for hybrid face detection through depth sensing. The hybrid face detection uses both software and hardware to enable realistic face-tracking filters. It also helps in improving security when unlocking a device with one’s face. The “unlocking a device with one’s face” part in the press release almost suggests that the next Galaxy flagship will come with a face unlock feature to compete with Apple’s Face ID. To protect all this critical biometric data such as facial, iris and fingerprint information, the Exynos 9810 also comes with a separate security processing unit – an approach similar to Apple’s A series processors. The Exynos 9810 features the industry’s first Cat.18 LTE modem to support up to 6x carrier aggregation (CA) compared to the predecessor’s 5CA. The embedded LTE modem can also reach speeds up to 1.2Gbps downlink and 200 Mbps uplink. Samsung believes these speeds will make it easier broadcast or steam in 4K or in 360-degree video format. The Exynos 9810 also makes improvements on the imaging front. The processor comes with a dedicated image processing unit and upgraded multi-format codec (MFC). This should result in better stabilization for images and video, real-time out-of-focus photography in high resolution, and reduced noise and motion blur for better pictures in low light. The upgraded MFC enables video recording and playback in 4k resolution at 120 fps. Samsung says the Exynos 9 Series 9810 is currently in mass production and will be displayed at CES 2018 in Las Vegas from January 9-12, 2018. Samsung’s flagship Exynos is already off to a good start as it has already been selected as a CES 2018 Innovation Awards HONOREE in the Embedded Technologies product category. The Qualcomm processor appears better on paper. I wonder if the Unlocked version gets this processor and does it have a advantage over the Snapdragon? To avoid looking like biased, This is why the S8 did not have 60fps recording enabled. The inferior SD845 model had only 30fps. How about Dual SIM Dual VoLTE? SD845/Kirin 950/MKT X30 are capable of DSDV.